As I mentioned in my post on Thursday, Vishnu and I spent a portion of the weekend in St. Petersburg. The purpose of our trip was to find an apartment and guess what…WE DID! I was honestly a little nervous that nothing would be available for when we needed to move, but it worked out pretty nicely. We were able to stay within our budget, and our new place is in a super cute neighborhood full of restaurants, shops, parks, etc. Now that we have a place and a move-in date the real work and planning begins… But I’ll save all that for another post. We didn’t just apartment hunt while in St. Petersburg. We also ate some really good food. On Friday, we went to a place called Meze 119 for lunch. 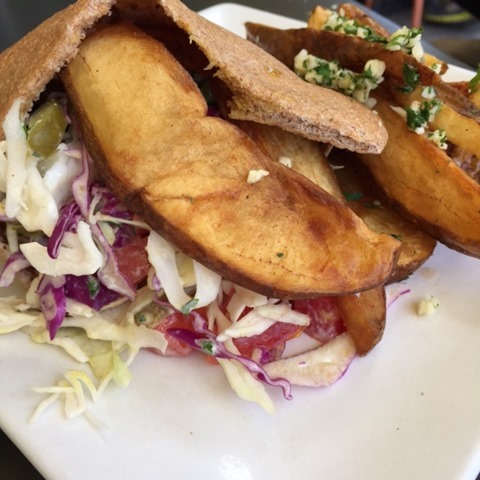 It’s a vegetarian (with some vegan options) Greek restaurant. The Yelp reviews I read were all pretty positive, so I knew we were in for a treat. 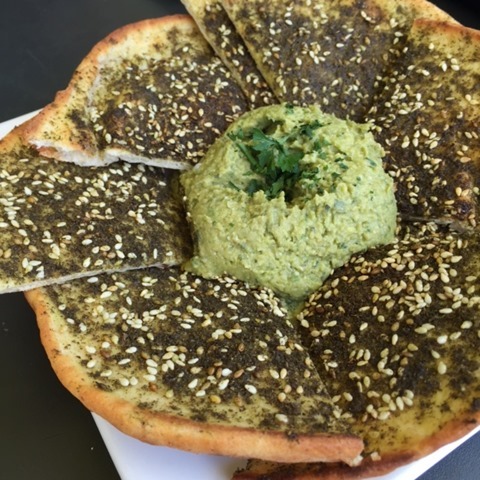 We got the basil pine nut hummus and zaatar bread to start. In my opinion, the hummus could have been a little more flavorful. It was all a little too subtle for my liking. The creamy texture was spot on though. 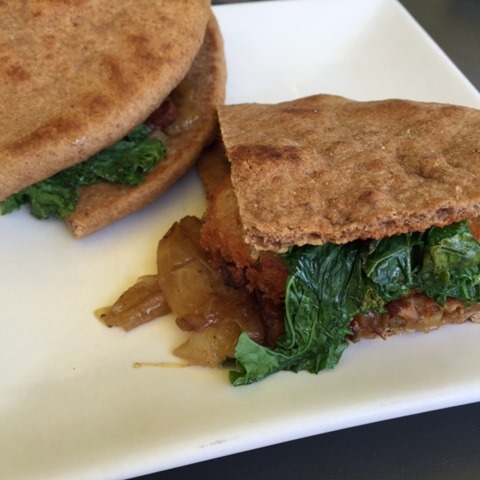 The zaatar bread was perfectly toasted, and the spices sprinkled on top added a lot of rich flavor. I also ordered the Cyprus BLT and loved the panko-crusted tomatoes, the olive tapenade, and the tempeh bacon. Definitely something I’d order again. Vishnu ordered the Shawarma and liked it a lot. While he loves his meat, vegetarian chicken is something he seems to be able to get on board with. I had a bite of his sandwich and really liked how saucy it was. Tons of curry flavor too. We ordered the garlic potatoes with his sandwich and am so glad we did. They weren’t super crispy, but the roasted garlic bits on top were spicy and added so much flavor. I heard the table next to ours ask for hot sauce, so I followed suit. You guys. I wish they sold this stuff by the bottle. The sauce had a spicy smoky vinegary tang. So good! Later that night, we went to The Refinery for dinner. All credit goes to Vishnu for finding this place and making a reservation. He was a little nervous that I wouldn’t like it because there weren’t too many vegetarian options, but we both agreed that his was one of the most creative meals we’ve ever had. The entire menu is made up of eclectic dishes that combine a number of very different/unique ingredients (read on for more detailed descriptions) that at first glance don’t seem like they would go together. But of course, everything was absolutely delicious. And the best part is that the menu changes every few days based on what the local farms can provide, so your experience will likely be completely different every time you visit. 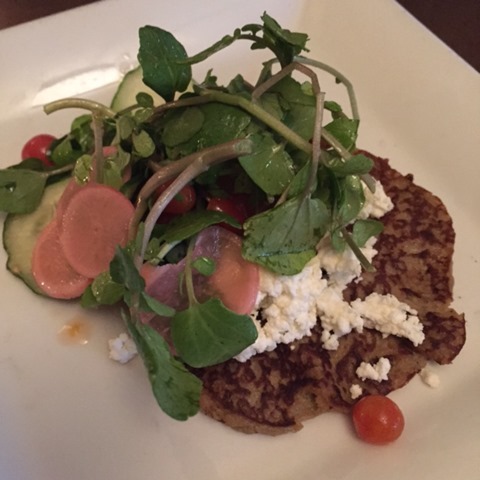 We started with the Eggplant Blini which was essentially an eggplant puree pancake with tiny tomatoes, cucumber, radish, ricotta, and orange. The pancake itself had a bit of Mediterrean flavor which all the other ingredients added to beautifully. I’m going to try to recreate this at home! For my entree, I ordered the Potato, Leek, and Yellow Squash Casserole. While this combination doesn’t sound unusual at all, the outside ingredients were plum and truffle honey. I was shocked by how well everything came together! 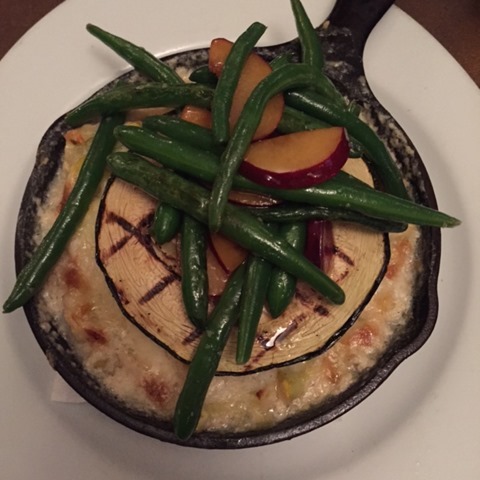 The casserole was rich and creamy, the vegetables were tender, and the plum/honey combo added a subtle sweetness. For his entree, Vishnu ordered the Butter Burger. 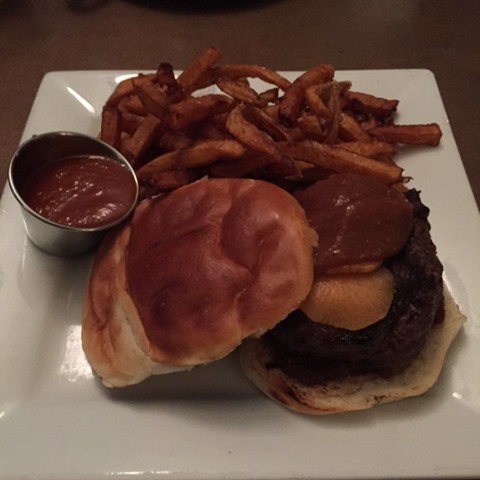 Talk about crazy combinations – this burger came with all different kinds of butters, including apple-raisin butter, peanut butter, tomato butter, etc. Our waitress highly recommended it, and Vishnu said that he could totally see why it was so popular. As with all the other dishes, non of the flavors competed with each other. The different components added to the overall taste in their own subtle way. Going into this meal, I told Vishnu that I didn’t want dessert. The two options on the menu didn’t sound all that appealing to me. Well, that all changed when our waitress (who was amazing!) took it upon herself to describe each one in detail. I obviously and rather quickly changed my mind on the whole no dessert thing! 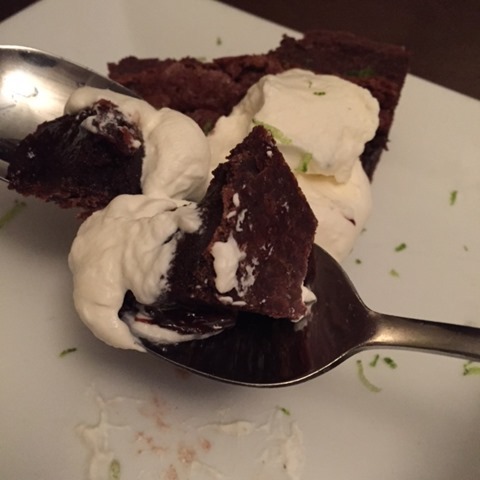 The best way to describe what we got is to think of a pie with a gooey brownie filling, a ginger shortbread crust, and lime whipped cream. Sounds insanely weird but it totally worked! The chocolate filling was dark and rich, the ginger crust was subtly spicy, and the lime whipped cream added a pop of citrus. I really really really hope that this dessert is on the menu the next time we eat here. So based on this trip, I think we’re going to adjust to living in St. Petersburg just fine! Now if only our current apartment would pack and move itself! Do you live in a foodie city? What’s one restaurant people should try when visiting? Yay congrats on your new place- I bet that makes moving seem all the more real!! I love that Vishnu, despite being a meat-lover, is happy to also come to all-vegetarian restaurants…talk about a good sport :)! If you’re in Orlando, I would recommend Rocco’s Tacos (a smallish chain). My favorite local place is Dandelion Tea. It’s cute and offers up organic and vegetarian friendly dishes plus lots and lots of tea options. yayy im so glad you were able to find an apartment.thats awesome. i went to a new place yesterday for brunch called savor..its more like a cafe + coffee bar. 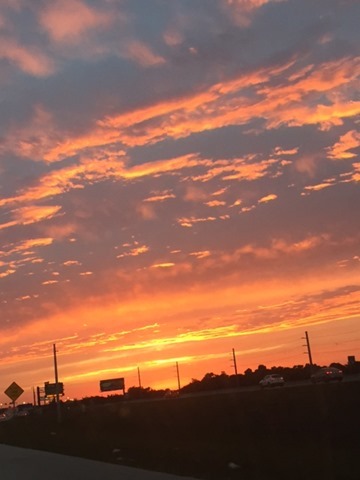 everything was spectacular. Yes, I do live in a foodie city. I love so many restaurants here—there are lots of good vegetarian ones (lucky for me) and lots of good Indian food places, too. So glad you found an apartment so easily! I love eclectic places like that where the ingredients sound crazy but end up tasting amazing. Thanks, Kacy! And I’m finding that the strange places are my favorite too. The weirder the better…sometimes! And I would definitely consider DC a food city! I’ve had lots of delicious meals there. Congratulations on finding a new place and wow, the food looks amazing!